Brought all the way from Japan, Tamoya set up its first overseas outlet in Singapore. 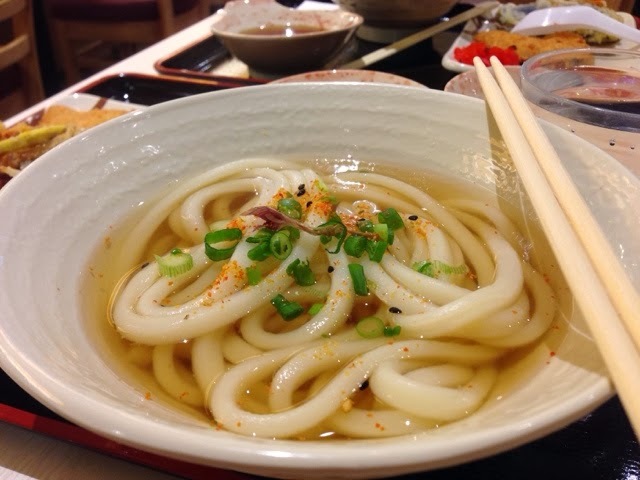 The Sanuki udon is hand crafted from Tamoya unique flour mixture and is served with their "golden dashi" broth. 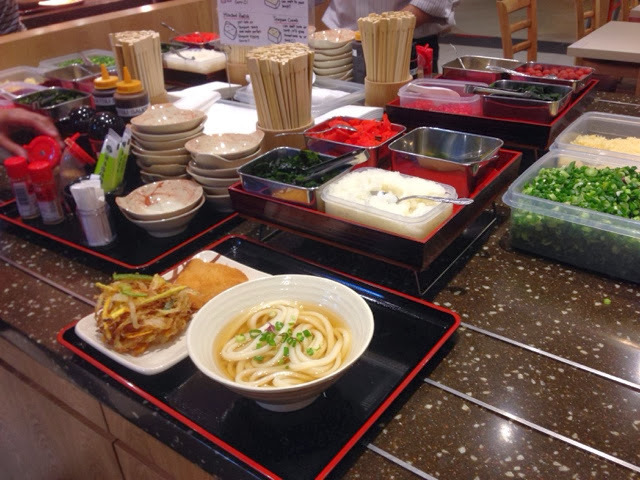 The udon restaurant has seen set up three outlets at Chinatown Point, United Square and Liang Court. 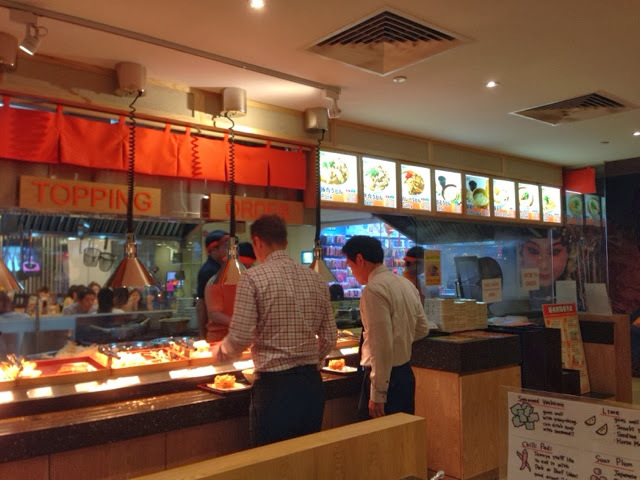 Choose a side menu from the counter. You may take as many sides as you wish. 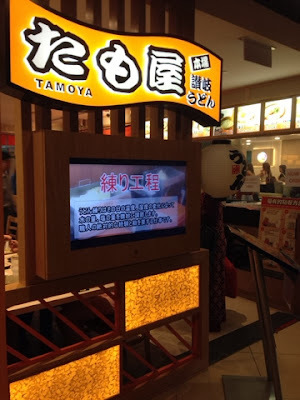 Previously, I had a wonderful dining experience at Tamoya. So, I decided to introduce this food joint to another friend. Unfortunately, I was very disappointed by the food quality and entire dining experience. The sides were cold and limp. How I wish that the sides were hot and tempura crispy. Worst of all, there were small flies flying around us when we ate our dinner. It was very distracting and frustrating. 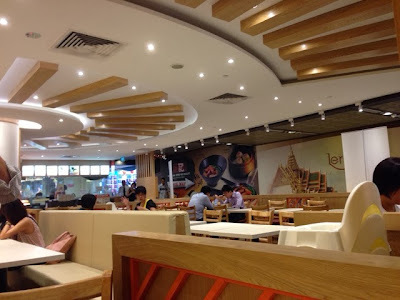 Although the place looked clean, I could not figure out how the flies could be flying in the restaurant. 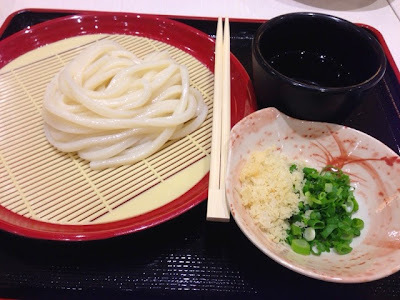 This time, we added two new udon and sides for review. The entire experience cost us about SGD30.00. I hope that the restaurant would improve its food quality and dining experience. Otherwise, I may not dine the restaurant in the near future. The dining experience with the udon was great as the standards were still maintained. 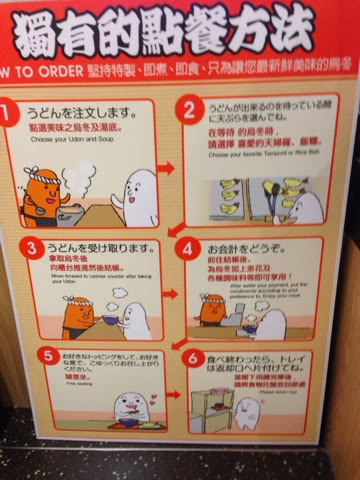 The noodles were perfectly prepared and they were chewy. The broths and dipping sauce blended very well with the udon noodles. 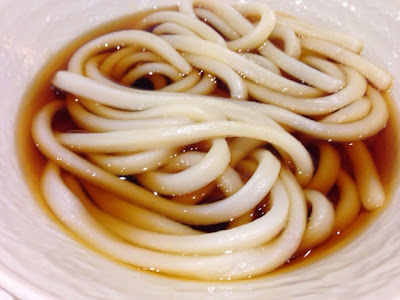 We ordered the usual Kake Udon served in rich "Golden Broth" taste. (see below for the comments). The broth was still light and rich and the noodles are chewy. 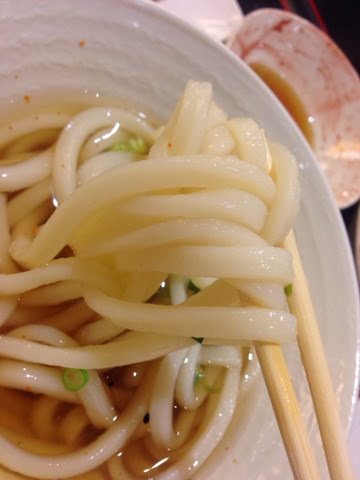 It was disappointing when the quality of the sides were not consistent with the noodles. They were all cold. It was around 6.30pm when we ate our dinner at Tamoya. 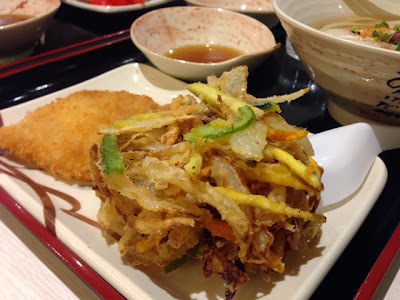 The sides were cold and were not crispy, particularly the tempura. Prawn Tempura was nicely cooked. The prawn was fresh. 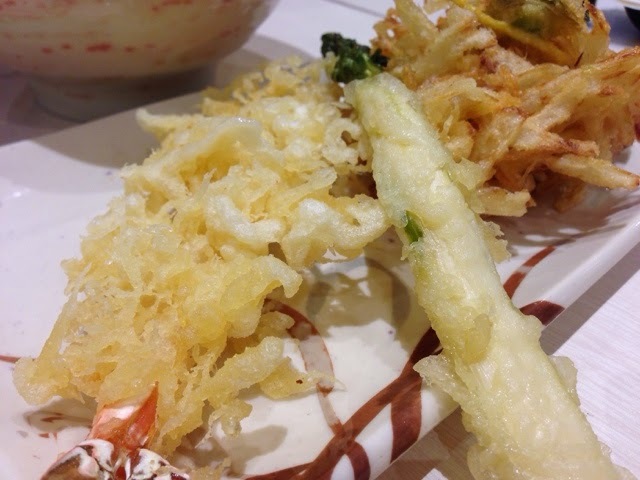 Asparagus Tempura was limp and cold. It tasted normal. Kakiage (mixed vegetables of onions, carrots and burrock) was cold and chewy. I wished it was hot and crispy. [Image above from right]: Sweet Potato tempura and Fried Chicken. 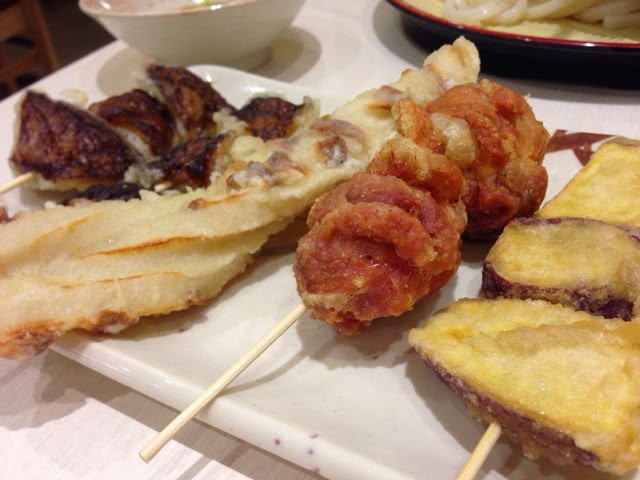 Fried Chicken was like Karaage Chicken. It would taste better if it were freshly prepared. 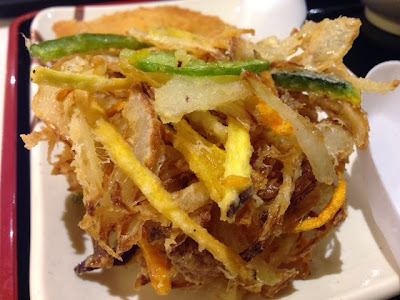 Sweet potato tempura was sweet. Shitake Mushroom was limp and was normal in taste. 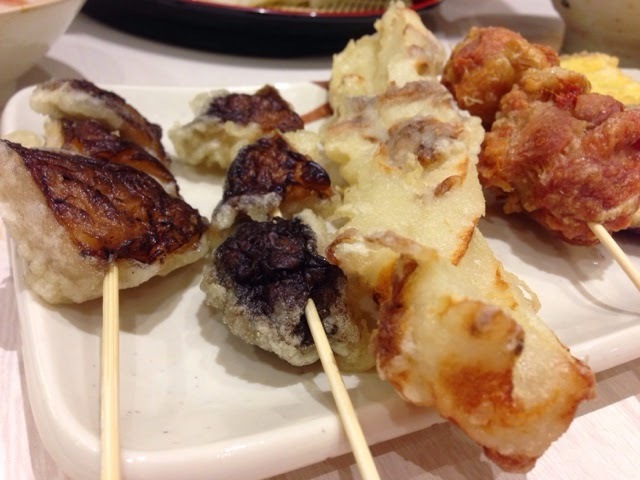 Chikuwa Tempura is made of a fish batter. It tasted like fish ball. My friend and I met at Tamoya for lunch. It was a great selection. 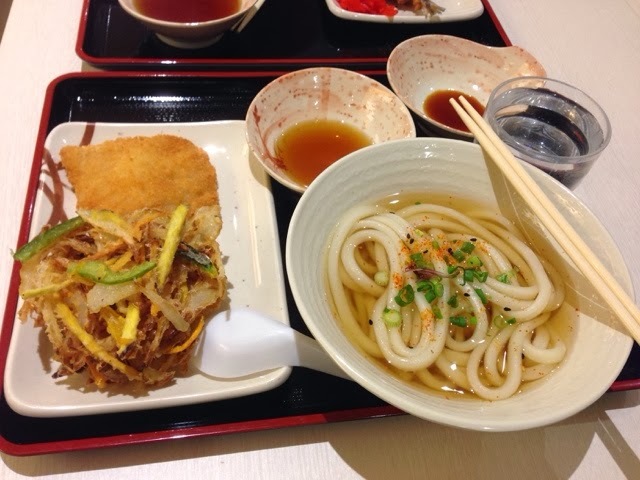 We ordered two sides and two udon noodles at around SGD18.00. I recommend that you try it too. I chose the Kake udon noodles, chicken cutlet and assorted vegetable tempura.